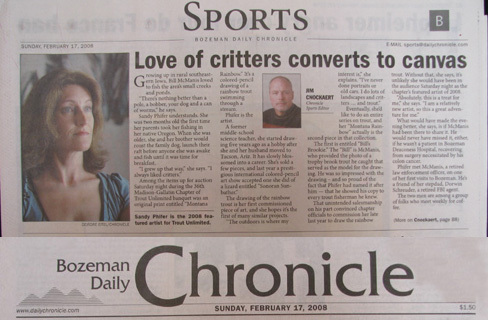 The newspaper article below, by Jim Cnockaert, was the lead story on the front page of the Bozeman Daily Chronicle Sports Section on February 17, 2008. 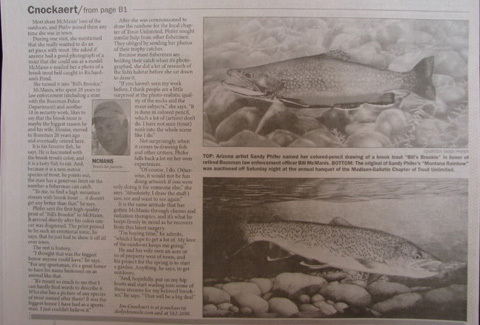 It tells the story of "Bill's Brookie" and gives some insight into the inspiration behind Sandy's trout paintings. Growing up in rural southeastern Iowa, Bill McManis loved to fish the area’s small creeks and ponds. "There’s nothing better than a pole, a bobber, your dog and a can of worms," he says. Sandy Phifer understands. She was two months old the first time her parents took her fishing in her native Oregon. When she was older, she and her brother would roust the family dog, launch their raft before anyone else was awake and fish until it was time for breakfast. "I grew up that way," she says. "I always liked critters." 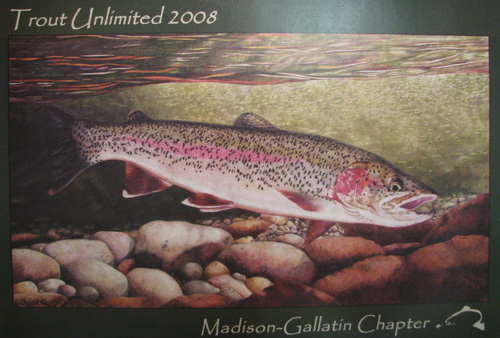 Among the items up for auction Saturday night during the 36th Madison-Gallatin Chapter of Trout Unlimited banquet was an original print entitled "Montana Rainbow." It’s a colored-pencil drawing of a rainbow trout swimming through a stream. A former middle-school science teacher, she started drawing five years ago as a hobby after she and her husband moved to Tucson, Ariz. It has slowly blossomed into a career. She’s sold a few pieces, and last year a prestigious international colored-pencil art show accepted one she did of a lizard entitled "Sonoran Sunbather." The drawing of the rainbow trout is her first commissioned piece of art, and she hopes it’s the first of many similar projects. "The outdoors is where my interest is," she explains. "I’ve never done portraits or old cars. I do lots of landscapes and critters. . . and trout." Eventually, she’d like to do an entire series on trout, and her "Montana Rainbow" actually is the second piece in that collection. The first is entitled "Bill’s Brookie." 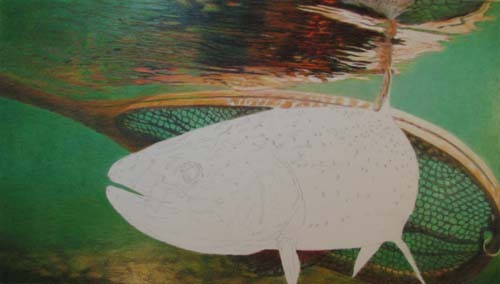 The "Bill" is McManis, who provided the photo of a trophy brook trout he caught that served as the model for the drawing. He was so impressed with the drawing and so proud of the fact that Phifer had named it after him that he showed his copy to every trout fisherman he knew. That unintended salesmanship on his part convinced chapter officials to commission her late last year to draw the rainbow trout. Without that, she says, it’s unlikely she would have been in the audience Saturday night as the chapter’s featured artist of 2008. "Absolutely, this is a treat for me," she says. "I am a relatively new artist, so this a great adventure for me." What would have made the evening better, she says, is if McManis had been there to share it. He would never have missed it, either, if he wasn’t a patient in Bozeman Deaconess Hospital, recovering from surgery necessitated by his colon cancer. Phifer met McManis, a retired law enforcement officer, on one of her first visits to Bozeman. He’s a friend of her stepdad, Dorwin Schreuder, a retired FBI agent. The two men are among a group of folks who meet weekly for coffee. Most share McManis’ love of the outdoors, and Phifer joined them any time she was in town. During one visit, she mentioned that she really wanted to do an art piece with trout. She asked if anyone had a good photograph of a trout that she could use as a model. McManis e-mailed her a photo of a brook trout he’d caught in Richardson’s Pond. She turned it into "Bill’s Brookie." McManis, who spend 28 years in law enforcement (including a stint with the Bozeman Police Department) and another 18 in security work, likes to say that the brook trout is maybe the biggest reason he and his wife, Elouise, moved to Bozeman 20 years ago and eventually retired here. It is his favorite fish, he says. He is fascinated with the brook trout’s color, and it is a tasty fish to eat. And, because it is a non-native species of trout, he points out, the state has a generous limit on the number a fisherman can catch. "To me, to find a high mountain stream with brook trout. . . it doesn’t get any better than that," he says. 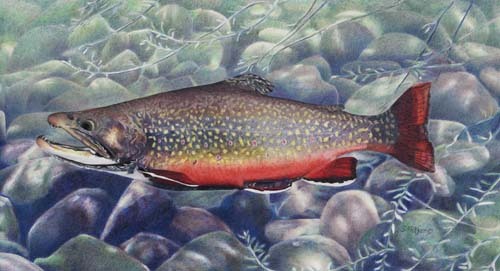 Phifer sent the first high-quality print of "Bill’s Brookie" to McManis. It arrived shortly after his colon cancer was diagnosed. The print proved to be such an emotional tonic, he says, that he just had to show it off all over town. "I thought that was the biggest honor anyone could have," he says. "For any sportsman, it’s a great honor to have his name bestowed on an animal like that. "It’s meant so much to me that I can hardly find words to describe it. Who else has a picture of any species of trout named after them? It was the biggest honor I have had as a sportsman. I just couldn’t believe it." After she was commissioned to draw the rainbow for the local chapter of Trout Unlimited, Phifer sought similar help from other fishermen. They obliged by sending her photos of their trophy catches. Because most fishermen are holding their catch when it’s photographed, she did a lot of research of the fish’s habitat before she sat down to draw it. "If you haven’t seen my work before, I think people are a little surprised at the photo-realistic quality of the rocks and the main subjects," she says. "It is done in colored pencil, which a lot of (artists) don’t do. I have not seen (trout) sunk into the whole scene like I do." Not surprisingly, when it comes to drawing fish and other critters, Phifer falls back a lot on her own experiences. "Of course, I do. Otherwise, it would not be fun doing artwork if you were only doing it for someone else," she says. "Absolutely, I draw the stuff I saw, see and want to see again." It is the same attitude that has gotten McManis through chemo and radiation therapies, and it’s what he keeps firmly in mind as he recovers from this latest surgery. "I’m buying time," he admits, "which I hope to get a lot of. My love of the outdoors keeps me going." He and his wife own an acre or so of property west of town, and his project for the spring is to start a garden. Anything, he says, to get outdoors. "And, hopefully, put on my hip boots and start wading into some of these streams for my beloved brookies," he says. "That will be a big deal."